Comfort Dorkutso is no stranger to hard work. To help support her family, she was forced to leave school to find work. The only thing available was working as a house to house revenue collector. Not an easy job, and one that earned less than CHF 2 a day. In 2013, Comfort heard about a new opportunity. 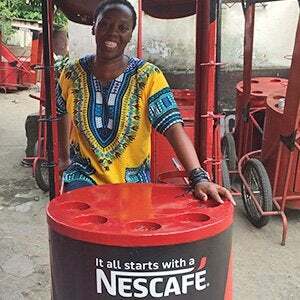 She had seen Accra's distinctive coffee vendors weaving their way through the bustling crowds. 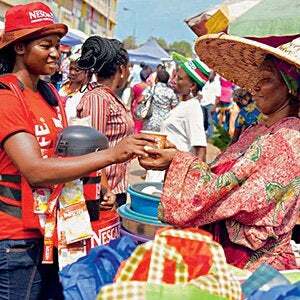 The vendors stood out in their bright red t-shirts as they sold Nescafé by the cup to stall owners, shoppers and even drivers stuck in traffic. What she hadn't realised was that many of these vendors were small business owners, working hard to generate their own income and grow their companies. She knew instantly that this was what she wanted to do. As a street vendor, Comfort is now earning around CHF 200 a month. Not only is she able to rent a small apartment for herself, she's also helping to support her siblings and her young niece too. This young entrepreneur doesn't lack vision, knows that her hard work will pay off. "I'm looking forward to saving up in order to build my own shop," she says, proudly. The 'My own business' scheme - known locally as MYOWBU - encourages people in Central and West Africa to develop a career and gain financial independence. 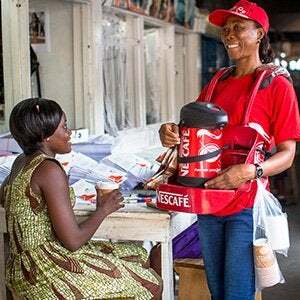 The initiative, led by the company's out-of-home business Nestlé Professional, is helping to provide thousands of people with the chance to head their own street-vending business, employing and managing their own street vendors. Today, Chrystèle owns a thriving business of 35 vendors who each take home an average income of CHF 130 per month. "It's really helped me become disciplined and mature in how I run my business," Chrystèle says. "My operators depend on their jobs to take care of their families. I'm also happier because I enjoy what I do."